Register and manage your app developers, as described in the following sections. (App registration is a separate process, as described in Register apps and manage API keys). Edge provides many benefits that are completely dependent on knowing who's calling your APIs. For example, API security, traffic management, and a fair amount of analytics data depend on knowing who's calling. And how does Edge know who's calling your APIs? By reading unique information in each API call, such as a user ID, an API key, or an OAuth token. That unique information locks or unlocks the functionality you build into your API proxies, giving you full control over API access and behavior. That's why app developers need to register to use your APIs. Once added, developers register their apps, choose the APIs they want to use, and receive the unique API credentials (consumer keys and secrets) needed to access your APIs. Warning: API security, traffic management, and developer/app analytics are dependent on proper API proxy configuration. For example, you need to add the right policies to your proxies, such as API key validation or OAuth access token verification, quota enforcement, and rate limiting. Those policies identify which specific developer and app is making the call, which in turn enables API security enforcement, developer- or app-specific traffic management, API analytics capture, and other functionality. Technically, you could develop open APIs that don't check for API keys or access tokens, which means you wouldn't really need to register developers. But we strongly discourage this, because you lose API security, lose control over performance (through good traffic management), lose out on analytics data, and miss out on other major benefits that Edge provides. As an organization administrator, manage developers using the Edge UI or API, as described in the following sections. When you add a developer through the administrator interface on the portal, you can set the developer's password for the portal and trigger an automated email message sent to the developer. When adding or modifying a developer using Edge, no email is sent to the developer and you cannot set the password for the developer on the portal. Therefore, the developer must reset their password on the portal before they can sign in to the portal. Any changes made to the developer's account on the portal are automatically sent to Edge. If you decide to manage app developers using Edge, you must synchronize app developers between the portal and Edge. Access and explore the Developers page using the Edge UI and Classic Edge UI. Select Publish > Developers in the left navigation bar. The Developers page is displayed. Select Publish > Developers in the top navigation bar. The steps in the topics that follow are specific to the Edge UI. The Classic Edge UI steps are similar to those described. Enter the developer details, including first name, last name, email, and username. View and edit developer details. For Monetization-enabled organizations, you can edit the monetization custom attributes defined in Configuring monetization attributes. Click the row of the developer that you want to view and edit to expand the details. In the Details section, the following information is displayed. Edit the developer details, as required. Details Developer first and last name, username, and email; registration status and duration; and developer ID. Modify the content and press Enter to confirm the change. Apps Apps that have been registered by the developer. See Registering apps. Activate or deactivate the developer in the Status field. For more information, see Activating and deactivating a developer. Core Persistence Services caching minimum: In organizations with Core Persistence Services (CPS) enabled (currently Apigee Public Cloud only), Edge keeps the following entities in cache for a minimum of 180 seconds after the entities are accessed. OAuth access tokens. This means the ExpiresIn element on the OAuth v2 policy won't be able to expire an access token in less than 180 seconds. Key Management Service (KMS) entities (Apps, Developers, API Products). Custom attributes on OAuth tokens and KMS entities. Add up to 18 custom attributes for each developer, including the monetization attributes described in Configuring monetization attributes. For the integrated developer portal, developer registration and portal login are tracked using the _apiportal custom attribute in Edge. For more information, see How app developer registration and login is tracked in Edge. Click the row of the developer for which you want to manage custom attributes to expand the details. Click + in the Custom Attributes section. Enter the attribute name and value. To delete a custom attribute, position your cursor over the attribute and click in the actions menu. When an app developer self-registers in your portal, you can configure whether or not they are active by default. When a developer is inactive, the developer can still sign in to the developer portal and create apps, but none of the corresponding API keys will work. The developer's apps still retain their approved (or other) status, as do the API keys, even though they're not valid while the developer is inactive. When you deactivate a developer, it may take a few minutes for the change to be updated on all message processors. Until then, some calls by the developer's app may succeed. Click the row of the developer that you want to activate or deactivate to expand the details. In the Details section, set the Status field to Active or Inactive, as required. Repeat the steps if the developer is in multiple organizations. Select Developers or Developers, Apps, and Products from the drop-down. The selected publishing data is downloaded as a CSV file. Warning: Deleting developers completely removes them and their related artifacts (such as apps and API keys) from your organization. To avoid permanently deleting developers and their artifacts, consider deactivating developers instead. Position your cursor over the row of the developer that you want to delete to display the actions menu. Click Delete to confirm the deletion. If you are using a Drupal-based developer portal to publish your APIs, changes made to app developers using Edge are not propagated to the portal. You must sign in to the portal as a portal administrator and synchronize the portal with Edge for those changes to appear on the portal. Note: If you use the Drupal-based developer portal, Apigee recommends that you manage app developers directly on your portal, not using Edge. See Recommendations for managing app developers on Drupal-base portals. With monetization, a company is a collection of developers managed as a single entity. A company can be any grouping that is appropriate to your organization such as business unit, product line, or division. Grouping developers into companies is useful when your need to have multiple developers associated under a single corporate entity. For example, you may need to set up different companies for billing purposes. However, developers in your organization don't need to be associated with a company. Note that a developer is always a single entity, uniquely identified by the email element. If a developer is part of a company you'll see the Company name on the Developers page. For more information about managing companies and developers for monetization, see Manage companies and developers. When editing a developer using the UI or creating or editing a developer using the API, you can configure the monetization properties defined in the following table. Initially, you configure the monetization properties for the organization when editing the organization profile. Note: In order to subscribe to a rate plan, if the developer is not grouped with a company, then the following monetization attributes must be defined for the developer: Address and Legal Name. Address of the developer, including the following fields: Address (lines 1 and 2), City, State, Zip Code, and Country. Note: The address is required if the developer is not grouped with a company and wants to subscribe to a published rate plan. PRORATED: Billing is based on the number of days that an API product is used in a calendar month. CALENDAR_MONTH: Billing is done monthly. PREPAID: Developer pays in advance for the use of an API product. Funds are deducted from the developer's balance when the API product is used. The developer must maintain a prepaid balance sufficient to purchase the API product. POSTPAID: Developer is billed monthly (through an invoice) for the use of API products. The developer pays for the use of API products based on the payment terms set by the plan(s) included on the invoice. BOTH: Supports either billing type. Defaults to PREPAID. See Configuring prepaid and postpaid billing types. Category MINT_DEVELOPER_CATEGORY Developer category to which you want to add the developer. A developer category is a grouping of developers or companies with similar characteristics. For more information, see Manage developer categories. Company ID MINT_COMPANY_ID Company ID, if applicable. For more information, see Grouping developers into companies. Developer Type MINT_DEVELOPER_TYPE This property is not used by Apigee. Is Broker MINT_IS_BROKER Flag that specifies whether the revenue is based on net. Legal name MINT_LEGAL_NAME Legal name of the developer that will be used in all reports. Note: This attribute is required if the developer is not grouped with a company and wants to subscribe to a published rate plan. Self Billing MINT_HAS_SELF_BILLING Flag that specifies whether self-billing invoices are enabled. If enabled (true), monetization generates a self-billing invoice instead of a revenue share statement. A self-billing invoice is a financial document that details the amount due to the developer. It acts as an invoice to the API Provider on behalf of the developer. Tax Exempt Auth # MINT_TAX_EXEMPT_AUTH_NO Government tax exemption number, if applicable. Tax Rate MINT_APPROX_TAX_RATE Approximate tax rate for the developer. Specify a decimal value with a maximum number of 3 characters before the decimal and 4 characters after the decimal. Manage developers using the Developer APIs. 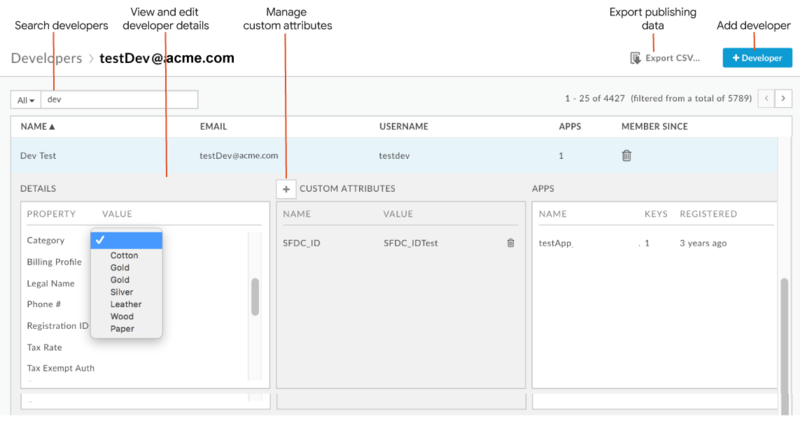 When creating and updating a developer using the API, you can configure the monetization attributes described in Configuring monetization attributes, as required.